Jumping on-board a Key West ferry is really so much more than a commute from one point to the other. The majority of people will travel down to Key West, by slowly following the vehicle in front all the way along the Overseas Highway. Hitting a top speed of 30 miles an hour, whilst the kids fight in the back, or the mother in law tells you why you should have gone elsewhere every 300 yards. They’re a bit annoying those Mother In Laws! Yes, it is one of those roads that you say “Man you have to drive this road its amazing”, but still using a Key West Ferry is more of a day out for the whole family than just another journey. Your Florida Keys vacation starts as soon as you get on board, which can't be said for the car most of the time. The Ferry has that.....x factor kind of quality. It must be down to the sunshine, the glistening blue waters, and the cold beer in your hand, but this is one boat that certainly doesn't feel like what I would expect from a ferry. I feel like a millionaire when traveling on the Key West ferry to Key West. So on this page I will do my best if i haven't done so already to tell you why you should at least once use a ferry to Key West and leave the car at home. I will also try to answer all the questions that you might be thinking about from cost to location, to departure times, to what type of beer they sell on-board. Ok the last one was a bit of stretch, but I ran out of things that I felt you might be concerned about. How Much Is A Ticket On The Ferry? There are three types of ticket for the ferry to Key West: Adults, Children and Seniors. Now before I tell you the prices, you may consider them to be quite expensive but consider the fact that once in Key West you don't really need a car. So if you take away the Key West car rental, or even the fuel down to the Southernmost point if you were planning of driving, it's not too bad at all. And also you wont have the hassle of trying to park down in the Old Town, which is a bit of a nightmare then the cost is....priceless. Experience an infamous Key West Sunset when you choose this Key West Express ferry trip! Travel to Key West from Fort Myers Beach, spend two nights and three days in Key West, then ferry back to Fort Myers Beach. The most fun and comfortable way to Key West! Where Can You Catch A Ferry To Key West From ? The two main places that you can get a Key West ferry is from Marcos Island or Ft Myers. Marcos Island is about 94 miles or 151.25 Kilometre's if you were to drive it down to Key West, and takes about 3 and half hours on the boat. Many people fly into Florida from both internal and international flights, so Marcos Island is a good place to head for as it has a few airports nearby. Fort Myers airport is the nearest, whilst Naples also has a small airport in operation too. The largest of the remaining choices that you can fly into are Fort Lauderdale and Miami International Airport which are much larger and both handle international services, so people flying in from further away will generally land at one of these. Then of course, if we moved away from Marcos Island and tried to fly straight into Fort Myers itself then this would be the best option of all, as if you can do it the transportation cost across to the dock will be less. There are quite a few transport options available at the airport, and you will looking at a taxi hire charge of around $50.00, which will take you from the airport right to the Key West Ferry dock in Fort Myers. Where does the ferry to Key West dock once in Key West? 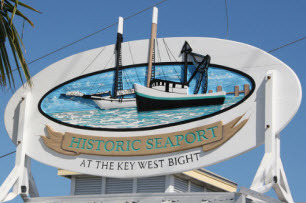 Once arriving at the Southernmost Island, the ferry to Key West comes to a stop at the docks at City Bight (I/O Flagler) Ferry Terminal, which is down by Key Wests historic seaport. This is a truly lovely way to enter Key West, as the seaport is full of fresh fish sellers, restaurants, boardwalks to stroll down and around, and a genuine feeling of "Who Hoo I'm on vacation"
You can easily get transportation to take you from here to your final destination, but if you are carrying your own luggage and don't have much of it, then it's not too far to walk into the hub of things. Have a little explore at your own pace. And that my friends is one of the great things about travelling on the Key West ferry. If you are like me, if you have a car you fill up every available bit of space with luggage and stuff. But with a ferry to Key West, you can spend 3.5 hours watching the waters of the Florida Keys pass you by, and then step off the boat and away you go. What To Do When You Get To Key West? Make no mistake for only a little place, Key West has so much there for you to fill your time. From Museums to Historic Homes such as those lived in by Ernest Hemingway and even ex-president Harry S Truman. Restaurants, attractions, camping, boat trips, the list is quite extensive and will have your head spinning as soon as you get of the Key West ferry. But don't worry, we have listed the best attractions and things to do in Key West to optimize your time, and make sure that you dont waste what time you have deciding on where to go. And of course read our fantastic guide before you set out to really give you a taster of what to expect after getting on your ferry to key West.